Another weeknight favourite, this pasta is ready in minutes! Most of ingredients are a staple in the average pantry so this dish may not require a trip to the grocery store. It is subtle and satisfying. Bring a large pot of salted water to a boil. Add the spaghetti and cook according to the package instructions, until al dente. In a large saute pan over medium high heat, melt one tablespoon butter. Add the onion and sweat until translucent, about 5 minutes. Add the garlic, and saute for 30 seconds until fragrant. Add the chilli flakes. Add the shrimps to the pan and cook until bright pink and opaque, 1-2 minutes. Add the wine and lemon and the other tablespoon of butter and leave to simmer for another minute. Season with salt and pepper. 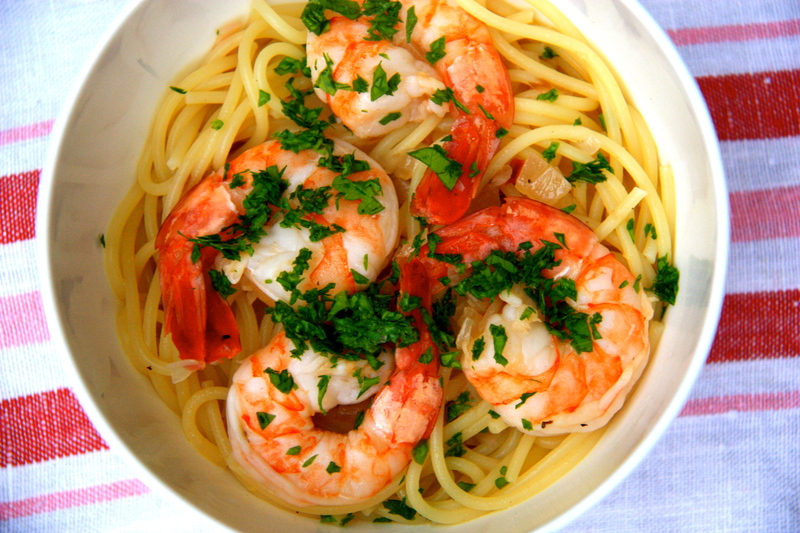 Drain the pasta and add to the pan with the shrimp and toss to coat. Add the parsley and check for seasoning. Serve and enjoy! If you find there is not enough liquid to coat the pasta add some of the pasta water and or a drizzle of olive oil.